My partner Liz is a member of several "Meet Up" groups in Cincinnati. Last night she took me along to her Professional Women's Meetup dinner last night. As always, I had very little idea of what to expect. At the least though, I should have expected the self introductions when everyone around the table introduced themselves. Of course, where I was sitting, I was second to speak. I am not new to introducing myself and anymore, not shy about doing it. I essentially said, "Hello I'm Cyrsti Hart, I am a transgender woman, blogger and writer. Needless to say, I was beginning to receive a little more attention by this time. My biggest mistake was not bringing enough of my Stilettos on Thin Ice book promo cards as most everyone wanted one. 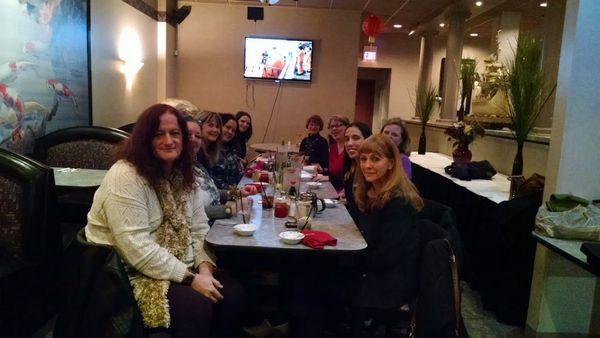 As far as the rest of the meet up went, I was flattered to be among such a group of interesting accomplished women. Accountants, Attorneys, Artisans and all. My gender take on the evening was, women as a group tended not to talk about the success of their business's as much as giving them a gentle networking nudge. All the time, they were mixing in tons of "soft" info about where they live, have lived or plan to live. Of course. I didn't expect a male dominated "sledge hammer" networking approach either, so for the most part (for once) I was quiet and learned. The most wonderful part of the evening when I walked away from the experience with yet more knowledge of the gender path I was taking. I'm most appreciative to my partner Liz for taking me and to the women around the table who welcomed me into their circle!